djkardkreations: Random Act of Kindness for W2CB and Happy Valentine's Day! Random Act of Kindness for W2CB and Happy Valentine's Day! Today's post is all about kindness, friendship, and love. You know, like normal. Piglet sidled up to Pooh from behind. "Pooh," he whispered. "Nothing," said Piglet, taking Pooh's paw. "I just wanted to be sure of you." When I want to make a card about friendship, I often reach for my vintage stamp, "Belinda and Bernadette the Bench Buddies" (EB224) from Stamping Bella. For the sediment, I used my NBUS stamp set, "Kind Words" from Altenew. I think both the image and the sediment are beautiful. I watercolored the card with my Ziggies. What part did Hammy play, you ask? Sometimes he has the day off from helping with a card, but even then he is my proofreader. In this case, I turned the blog over for his review and in about one second, he piped up and asked me why I hadn't colored the butterfly? Oops. By then it was pouring down rain so I couldn't retake the photo, but I was able to color in the butterfly before I mailed it off. Thank you, Ham. I hope you have a chance to play in this month's W2CB challenge! There are lots of options for creations that evoke kindness and/or friendship! The challenge is open from February 13 to March 6. I'll be back with a mid-challenge reminder on February 23rd. 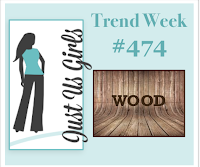 Just Us Girls: Trend Week: Wood. Here's my VD card for you! 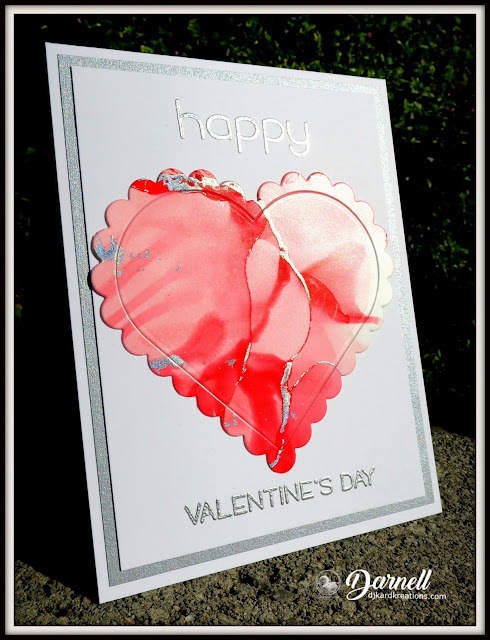 A plain white base with a schparkly silver panel topped with another white panel with Happy Valentine's Day embossed in silver. The focus pocus is a scalloped heart from PTI cut from an alcoholic Yupo paper which has been shot through with silver foil. Harriet and I made a bunch of these delicious backgrounds in different colored AIs on a recent play date. You'll be seeing the rest of them showcased in a future post. Cards for Galz: Hearts: red, pink, and white. Use Your Stuff: Hearts: pink or red. Here are some other QACAS VD cards I made. I made still more, but I sent them off without photographing them. Update on the Mister: After taking an ambulance to the emergency room yesterday and spending all day there, Kevin is doing much, much better! They pumped him full of pain medication and steroids to the point where the sharp agonizing pain was diminished and he could stand and take steps with the aid of a walker. Hurray! That means the surgery can be postponed yet again, but we will be following up with a specialist. Thank you all for your kind comments, prayers, and positive thoughts! They mean so much to us! Two stunning cards Darnell, the top card is a beautiful one to send to a friend and I love the yupo heart card with the shot of silver through it. Sorry to hear that you've had a trip to the hospital, but glad that the mister is doing well. Love your friendship card and what a fab sentiment. You seem to be in VD overdrive too. No VD cards displayed in this house since 1975! Not that I'm counting, ;). What a lovely friendship card .... great image and I love the words. Gorgeous VD card too .... love that beautiful big heart. Praise the Lord for pain medicine and for letting your husband move and postpone for a while. The hospital is no place to be. Good eye, Hammy, for catching the butterfly no color. Beautiful Valentine's Day cards and I love the quote by A.A. Milne on your kindness card. I love Pooh, too. Oh scary and stressful times for you and the Mister, Darnell. I'm so relieved he has found some relief. I hope soon he can get a long term solution in the works. Hugs to you both. Your main card is beautiful, both in image and sentiment. Thank you for sharing it and reminding us how it doesn't always take a grand gesture to touch a life and make it better. You know you do the same thing on your blog here, right? You are a shining light for kindness and generosity and lighthearted humor. Thank you! Your cards are all beautiful, especially because you made them! Hugs! Congrats on your GDT spot! Truer words have never been printed or spoken as those on your first card! LOVE it! Love all of your cards too, especially that gorgeous yupo heart with silver! WOWSAH! How'd you did that? LOL So glad to hear the Mr is doing better, and I hope he continues to improve. Pain is not fun! TC! Love, love, love the first card! What a wonderful image! I can see why it's one of your favorites. The sentiment is perfect! The AI heart has so much movement! The heart was the perfect die for this piece! I'm thankful that Kevin is up and about again. I pray the specialist can give him permanent relief. Thank you so much for that gorgeous Valentine. Oh I love Pooh... this just warmed my heart, D. Now I wish it could work on my feet! Need I say how much I love this card? or all those wonders in gray? Didn't think so, but happy to just the same - LOve B&B and that wonderful sentiment, my friend... just the truest words! Take care of that mister... and you, too. What a lovely card! I would never have noticed the butterfly:) The other cards are also wonderful. Thanks for the inspiration! I need to pull out my alcohol soon. That heart is gorgeous, Darnell, and must also get some silver foil as all I have is gold. The sweet girls on the bench are heartwarming and wonderfully colored - minus the butterfly. ;) I have a number of longer sentiment like this and never use them because I think they're too long or big for the front of a card. You've proved me wrong and with my non-resolution of using neglected stamps I'm getting them out. Your cards are always such a joy to see Darnell! LOVE that heart ... just beautiful! So glad to hear your Mister is having some relief. Prayers continue for him! Thanks so much for joining in the fun at our Double D ‘Hearts’ challenge! Good Luck and we hope you’ll come back often. Oh golly, poor Kevin, I really hope that the pain stays away and he can feel a bit more comfortable. Thinking of you both! I love the sentiment on the first card (and those ladies' shoes too), it is such a powerful sentiment. My lovely neighbour died in the night last night and I am so pleased I got to visit her to show her how much I cared..... very sad times. The friendship card touched my heart. That is the most beautiful sentiment and is so true. The AI heart with silver is stunning. It just catches your eye and makes you smile. All of the cards are pretty. Great news about Mister. So glad he is back on his feet with no pain. Aaahhh...Such sweet girlfriends and beautiful sentiment, Dolly. Your absolutely Gorgeous AI heart is stunningly creative and elegant. I love the red and metallic silver and your beautiful framing. All your sweet QCAS Valentine's will be loved and appreciated by your friends too. TFS all your wonderful cards, my friend. So glad the Mister is feeling better, back pain is so debilitating. Super coloured card and what a delightful and meaningful sentiment. Hammy has sharp eyes as I would never have seen this and who cares about these little things! Adore that shiny background and all Valentine's cards are fab. Here we only send to our one Valentine...do you have lots of secret Valentines or do you send them to friends too? Beautiful cards Darnell! I adore that sentiment on the friendship card (a favourite image of mine too) - and the silver foiling is stunning! We need to know how you did that! Most of all, so pleased that Kevin has found some relief and is able to move around. Here's to a permanent solution before too long. Your kindness card is, not only beautiful, but an excellent reminder of what humans should be...just there, listening and caring. And that big heart is fabulous. So happy to hear that the Mister is doing better with the help of meds. Would be wonderful if he could avoid the surgery and heal on his own. Still bombarding you with positive vibes and prayers. Kindness, friendship and love...what a perfect post Darnell. Your gals on a bench is wonderful and I hope that we all have a friend we can picture sitting there with. Your AI heart is gorgeous with that silver vein running through. Looking forward to seeing more of those. Twofer extraordinaire! (good thing I had spell checker for that one!) each card is spectacular in the true Darnell style!! Love your tribute to friendship and love both!! Glad to hear the Mister is back home but so sorry to hear he is suffering with his back! I will add him to my prayers... and you too! I know how dreadful it can be to watch someone you love suffer so. Such a beautiful and sincere first card Darnell and the most wonderful sentiment and I quite like the butterfly un-coloured but please don't tell Hammy x. Thank you for the Valentine's card and what a stunner it is and looking forward to seeing more of your wonderful creations with the Alcohol inks and pop of foil. I really like the text on the one with the two girls. Hope your hubby stays much much better for a long time, so he doesn't need an op. So many awesome cards Darnell. Love the first one, reminds me of my Bff and me. So sorry to hear about the Mister, I had to go back and find out what happened. Glad to hear he is doing better. What we have to go through to get older. Lol. LOVE the friendship card, Darnell! The sweet image of two BFFs is beautiful. Thanks for the VD card inspirations also. Happy to hear Kevin is doing better, will continue to say prayers, dear friend! firstly I do hope Kevin continues to be pain free for sometime. The steriod injections worked wonders on my shoulder recently. So lets hope his lasts for a long time for him. Love your wonderful card and the scene is so super and coloured in perfectly too, and the sentiment is so perfect for the card. 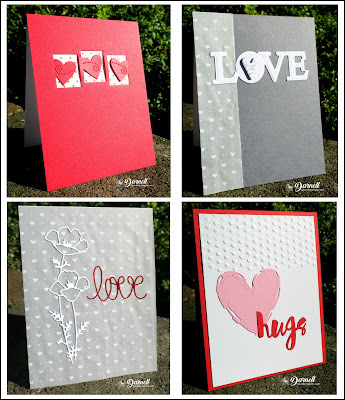 Beautiful Valentines cards also and tjeir designs look so awesome. Lots of crafty love and hugs from my house to yours. Jenny L.
Wow, you've dazzled us with all of these gorgeous cards in one post. That friendship card is so heart-warming, and I would have told Hammy that I left it uncolored on purpose...so as to highlight the image of the girls! Don't know if he would have believed you, but I would have! Your yupo colored heart card is beautifully CAS, and silver is always a favorite. I barely managed to make two Valentine cards this year..so kudos to you. Hmm, I seem to have missed the whole story about Kevin's trip to the hospital so looks like I need to go back and read your previous post. The good thing is that he's feeling a bit better though. Fabulous first card, super image and great sentiment. The background is really super on the second card. A lovely collections and designs of the group of cards. So glad to hear the Mister has gotten relief from the pain and is managing to get about a bit, and hopefully the visit with the specialist will go well. The golden oldie stamp really is a beauty! And such a perfect quote to go with it; makes the card a special one, for sure with the beautiful colouring! And the VD-card looks super with the tiny bith of silver also on the heart! So love your friendship card Darnelle - so so true! Awesome AI-ing on that heart - simply stunning. When I look at this card it screams Darnell. It has the warmth and compassion of friendship that you show on a daily basis with your love and support in blog land. So happy you linked up with us at Just Us Girls. As for the hubsters....scary time! I hope he continues to improve! I will keep you all in my prayers! Cute card! Love the image and sentiment! My favorite is definitely the first one, because I like that quote by Leo Buscaglia. I read his book a long time ago" Bus 9 to Paradise" I think I'm going to try and read it again...since I just found his book again. One of stories I enjoyed reading about him, is how his neighbor had complained that he didn't rake his leaves... So He raked them and then spread them on his living room carpet so he could enjoy them longer! Now there was a man who appreciated life and all that was around him. I thought you might enjoy that little tidbit...(I consider you to be someone who also enjoys everything about life and shares the joy with everyone that's around you). The leaf story is true you can check it out on google. Forgot to add to my post...that I was so happy to read that "mister" is doing better! Congrats on GD, Darnell! 🎉🎉🎉 A very sweet GD card beautifully coloured. And thanks for spoiling us with an incredible collection of love/valentine’s cards. I just love little Piglet and Pooh and their sweet relationship! This is a wonderful friendship card Darnell. And bless that Hammy's heart for his keen eye. Poor Mister, sure hope he's feeling better soon. I could just hug your cards, they are both so delightful! I am terribly sorry your hubs is having health issues that cause him so much pain and discomfort. I send him my very best wishes and all the healing vibes I can muster. So sorry to read that the Mr has been in such pain and a trip to the hospital, never, never fun. But the good news is that he's doing better and the surgery can hopefully be put off again (crossed fingers!) Continuing to send good thoughts out into the universe for you and the Mister. Since, I know very well, that he's not the only one affected by this! As for your cards, they are gorgeous as always. Love, LOVE the sentiment on the first one with the friends. It's SO, SO true! Sometimes people have no idea how much their words and caring actions can mean. I don't comment as often as I should but I do read and admire each and every post! Hi to Hammy! A special treat today with your watercolor, Darnell! The sentiment is very moving and so lovely with the Bella image. And the heart! Oh, my, the background you cut it from is mind-boggling beautiful. I'm glad you got some Valentine's sent off. I did not do well this year. Only made my hubby's and it was made months ago for one of the Twofer challenges (thank you!). I hope the Mister keeps improving! Congrats Darnell on joining us at W2CB as Guest-teamie. I love your great card (so appropriate for our current challenge), with fab colouring. Had a wander through your wonderfully organised playhouse...love that too!! Hi Dolly. Congrats on being Guest Designer at W2CB!! LOVE your bench buddies ... makes me think about seeing you in May and we'll be sitting hugging like that! Your Valentine's Day card is GORGEOUS. LOVE that AI heart with the silver foil. Beautiful! I bet you and Harriet had a wonderful day playing together. 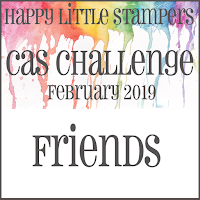 Your array of CAS Love cards are all beautiful. You have a lot of energy to make all these cards! What a fun twofer post - I am taking a class with Yupo paper and alcohol inks next week, anxious to see what the teacher comes up with. The teacher is an artist vs. a paper crafter. The bench friends is so pretty - would be one you use frequently. 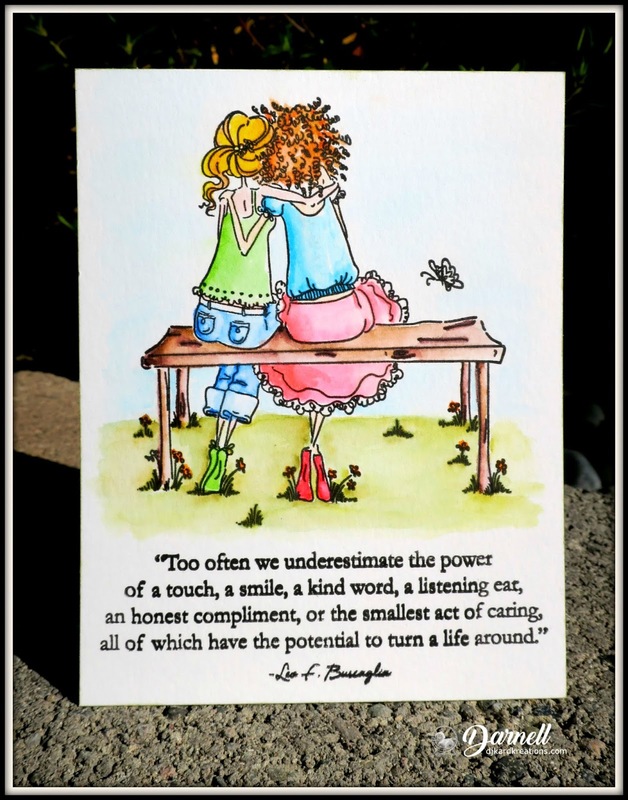 What wonderful words on your card Darnell, so true, and a brilliant image to depict Friendship. Fabulous heart cards too, lovely designs and colours. Happy Valentine's, Darnell. Stopped by to see your RAK card, and it is just adorable. Today we have a break from snow and I must get back to work. I also wanted to see the update on Kevin, as Carol told me about that situation. Sending good healing vibes. Love how you combined the vintage and the new, and of course your coloring the perfect complement! Thanks so much for being our guest at Words 2 Craft By!! Such a beautiful, loving card for W2CB, Darnell. The image of those two sharing a moment is really enhanced by the sentiment, and your coloring is wonderful! I love all of your Valentines! What a gorgeous AI heart with that striking silver! Happy Valentines Day! Your friendship card is heart-warming and beautiful on every level imaginable! So thrilled you shared this special gem in the HLS and JUGS galleries! Excellent news about Kevin...prayers continuing! Both of your cards are amazing. I'm impressed about colouring of the couple on your first card. The heart colored with alcoholic inks is fabulous. Happy Valentin's Day to you! Darnell, it's been too long since I've paid you a visit, and when I saw your 'alcoholic' card in the Double D lineup, I just had to come over. Working with alcohol inks are so much fun. Played all day today with them. No trip to the ER is fun, but happy to hear your hubby is managing with the. pain. Prayers continue for you both. And have a Happy Valentines! Hugs! PS, blog still not fixed, Loll Thompson is helping. Not a big google fan right now! What a super sweet friendship image! So sweet and such pretty coloring! I actually like the butterfly uncolored! It could be a signature thing, leave a tiny piece uncolored on a card! :) Your heart is stunning! The four Valentine cards are beautiful! You have been so busy to create even more and have them sent off! so very sorry to hear about your husband. I hope for continued improvement! Such lovely cards. Do love the besties on the bench seat. Stamping bella do make gorgeous stamps. Good pick up by hammy too! Glad to hear the mister is recovering. Hope he isn't in the hospital and out of action for too long. Yay Darnell, I was so happy to see you were joining us this month as a guest designer over at W2CB! 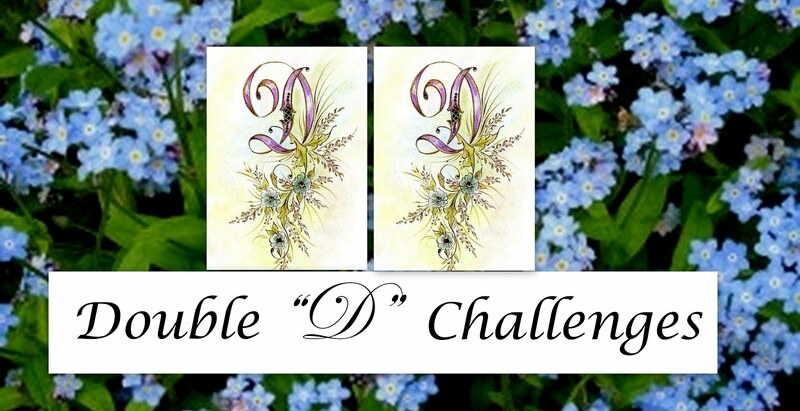 I am a huge fan of your work and absolutely adore your entry for this month's word challenge...just beautiful! Your AI heart is absolutely STUNNING!!! I love the bits of silver foil throughout, and how you used silver in your embossing on this card...just beautiful, my friend! Thanks for also sharing a few of the cards you sent off, too...just lovely in every way! Your friendship card is just delicious, Darnell. I love that image and it pairs perfectly with that lovely sentiment. Your heart is stunning, as are your other Valentine cards, you've been so busy! 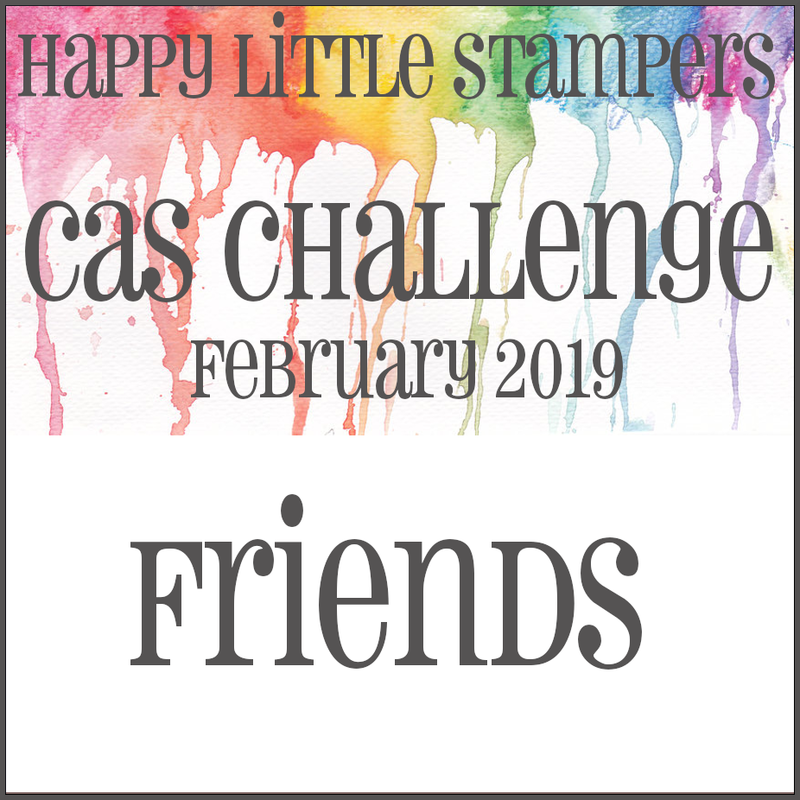 Thanks so much for playing along at HLS CAS challenge. So sorry to hear about the mister, but glad he's getting some relief. Bumper hugs to you both. Whenever I pop by I'm angry with myself for not visiting more often, so sorry for being a rubbish blogger friend. Oh how I LOVE that image!! Your coloring is fantastic!! That sentiment is also perfect. I think I might need that sentiment stamp set now!! Your friendship card is such a delight--love everything about it! Your coloring of a super sweet image is wonderful and I adore that sentiment. That Altenew set is definitely going on my wishlist. The gorgeous colors of the dreamy heart are perfect for Valentine's too. All the cards are beauties! Hope Mister is able to stay as comfortable as possible until seeing the specialist. You both will be in my thoughts! Popped back through posts to read up on Mister dear Darnell.. i can't help thinking masking the pain is temporary and readiness for surgery maybe wise .. but docs and you are this so praying the right decisions will be made at right time for the dear man and your dear self too.. as nurse.. I've chuckled my way through etymology lessons and google settings suggestions.. think my email still working.. its conniptions can be frustrating/ confusing at times... lots of luffly cards and yes i do challenges go to link up and they've expired too!! Oh wow--Valentines Day is your holiday, Darnell! These are beautiful! The friendship card is amazing--the image, sentiment & your coloring! Glad Kevin got some relief from the ER visit & hope it continues while you wait to see the specialist! February slipped by when I wasn't looking! Sorry for this late visit! Grandkids seem to have occupied so much time... that and old age related forgetfulness! I love this friend card Darnell, that sentiment is just perfect!